Peter preaches the gospel. Christ was rejected but faith in Christ brings healing. Christ the fulfiller of the prophets. You could really sing just about anything for this reading. TiS 242 / AHB 183 / AoV1-018 / ATN 27 / CH404 / UMH261 / VU352 / A&M667 / HPP163 / GtG157 / PH302 / G(II)481 / GC708 / GC(II)689 / G(3)796 / CP(E) 468 / W&R118 / Lau765 / StF247 I danced in the morning / Lord of the Dance (Sydney Carter). Lyrics. You all know this one, right? Good for kids Oldy-but-a-goody. TiS 178 / G(II)335 / GC478 / GC(II)487 / G(3)565 Praise the God who changes places (Brian Wren) I like the joy of the tune written by William Rowan (BOE) for this song. Lyrics. Sound sample. TiS 210 / AHB 141 / NCH042 / CH352 / UMH57 / VU326 / LBW42 / ELW295 / A&M742 / HPP74 / GtG610 / PH466 / CP306 / CP(E) 534 / W&R96 / Cha005 / Srce506 / 82Hml-493 / StF364 / MP496 O for a thousand tongues to sing (Charles Wesley) A classic. I particularly love NATIVITY for these words, and it's such a fun tune. Be careful with the words "ye dumb". Voices United has "Hear him you deaf, you voiceless ones, your tongues again employ" which is more respectful. Lyrics and sheet music. Oldy-but-a-goody. Answer when I call; when you are disturbed ponder it on your beds. God brings safety and hears. Church folders Turn an ear to me O Lord / Answer when I call (James Foley) This is actually a setting of Psalm 102, but the refrain will work for this Psalm as well. It's in the folders at Brunswick UCA. Lyrics & Youtube. Sound sample. Tune In / Online Resource Shepherd of the night (Elaine Loukes) "Have you ever felt the velvet night wrap you in her warmth". A lovely song with a theme of God’s protection. This is tricky for a congregation, so you might want to ask the musicians to play this. Free downloadable songbook. Iona (T1AU) / CH222 / StJ / PfAS004B Night has fallen / Dzuwa lapita (Malawian evening hymn) A simple Psalm refrain, this one is quite lovely with or without the rest of the Psalm being read or chanted. Lyrics and sheet music sample. PfAS004A O God defender of the poor (Timothy Idle) Good strong metrical words set to BROTHER JAMES' AIR. New words to old tunes. NCH553 / UMH375 / VU612 / WoV737 / ELW614 / HPP379 / GtG792 / PH394 / G(II)460 / GC648 / GC(II)617 / G(3)640 / W&R631 / Cha501 / ZSS114 / SgTJ1045 / 82Hml-676 There is a balm in Gilead (African-American traditional) This beautiful song, while not steeped in layers of meaning for non-Americans is worth singing wherever you live. Choral arrangement sound sample. Oldy-but-a-goody. 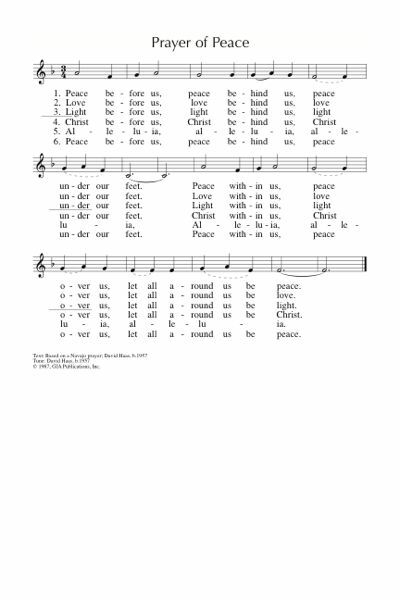 VU727 In the night I can take my rest (Helen Wright) Simple refrain to a responsive setting of the Psalm. *AoV1-056 / CH217 / GA541 / G(II)551 / GC761 / GC(II)750 / G(3)859 / URW201 / Lau881 God of Day and God of Darkness (Marty Haugen) This song is specific for evening services, but lovely words and set to a familiar tune (BEACH SPRING). I often think this is only good for an evening service, but the image of darkness and night doesn't have to be taken literally, and the call to rest at the end of the last verse would be good for those who take the celebration of Sabbath as a call to rest. Lyrics. New words to old tunes. *AoV2-091 When The Night becomes dark your love O Lord is a fire (Suzanne Toolan) A lovely simple chant. Sound sample. Taize / PH160 / PfAS004B In the night I can take my rest (Anthony Teague) A simple refrain to the Psalm. 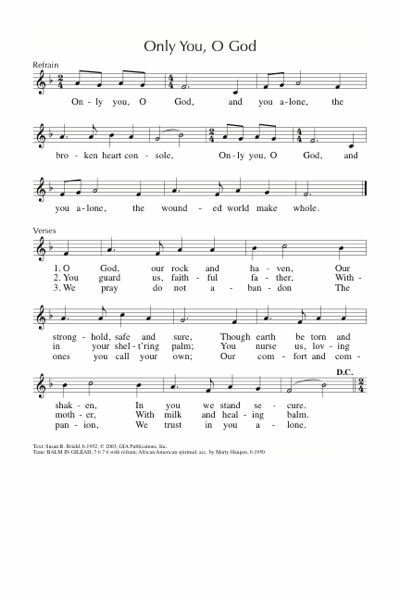 *GC(II)618 / G(3)729 Only You O God (Susan Briehl) A nice alternative to "Balm in Gilead", sung to the same tune. Verse 2 is particularly touching. Lyrics and sheet music. Sound sample. *Taize When The Night becomes dark your love O Lord is a fire (Jacques Berthier) Lovely Taize chant. Sound sample. *Recorded music In the stillness (Trish Watts) This beautiful chant would fit well with the Psalm; from her album "Invokation". "In the stillness, there is a sweet gentle voice, calming the storm in the night". Available here. NCH Psalter004 Let the light of your face shine on us O God (Peter Niedmann) A very simple refrain and chanted (or read) Psalm. We are God’s children. In Christ there is no more sin. TiS 546 / AHB 122 / CH491 / CH492 / LBW309 / ELW599 / A&M127 / HPP405 / GtG417 / / PH301 / CP511 / CP(E) 97 / W&R386 / 82Hml-641 / Lau204 Lord Jesus think on me (Synesius of Cyrene) Most versions of this are difficult to relate to, but CH492 has the best words of all translations I've found. I think it's great to be able to sing these ancient words from the 4th century with generations who have had the same anxieties that we do. AoV2-037 Children Of God in one family (Christopher Walker) Great for kids. Sometimes we mess up, but God forgives. Lyrics and sound sample. Good for kids. AoVK-119 We're God's family God's children (Trish Watts / Monica O'Brien) Good words. Catchy tune. Good for kids. *MV157 I am a child of God (Bruce Harding) A simple song with powerful words. Good for kids and adults alike. Very easy to learn. Good for kids (just the first verse probably). Christ revealed in the breaking of bread and he eats some fish. Christ as the fulfillment of the prophets. AA016 / Online Resource Christ is our peace (Shirley Murray) Wow. This one is excellent. Would also be good for the offering. Very simple Irish traditional tune. Lyrics & sheet music. *GGives2 What does peace look like to you (Mandy Dyson) A really nice simple song for kids about peace. Lots of questions about what peace might mean from images of nature, to an end to war. The last verse talks about a "bridge from God to man" which could be changed to "bridge from God to us". Good for kids. Tune In: Making things new (Sheree Anderson) A groovy one. Great for kids, and lots of fun. Free downloadable songbook. Good for kids. ATW 437 I have seen the Lord (Robin Mann) I like this one. Lyrics here. *FFS61 The grace of God has appeared (Cecily Sheehy) A simple short song. 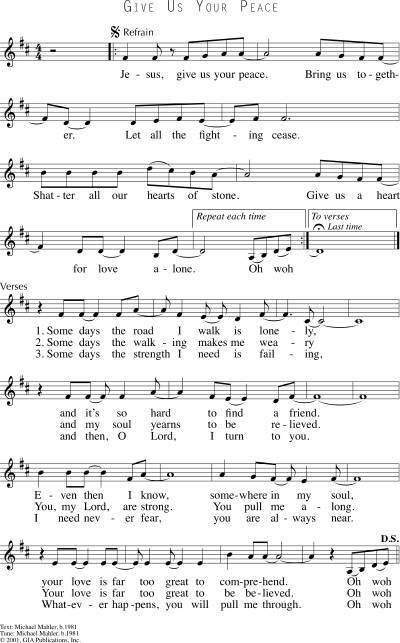 Would be great if you can have SATB singers on the parts, but will also work with just the melody. "The grace of God has appeared, bringing salvation to all". *AoV1-091 / AoVK-68 / StS016 / G(II)527 / GC(II)720 / G(3)821 Peace before us peace behind us (David Haas) love this one. Reflective. Careful not too get too schmaltzy because it's long. Less is more. It's good to do something while singing this song. I did a circle dance at church to this once upon a time, but I can't remember how it went. It works well at a walking pace. Schmaltzy and SLOW sound sample. Lead sheet. Good for kids. What will you be singing? I'd love to hear your ideas - please share in a comment below.